The Hancock Arts Council and Bellysima Bellydance will present Evening of Bellydance, Friday, February 15, 2019 7 pm at the Performing Arts Center at Town Hall, 126 West High Street Hancock, Maryland. 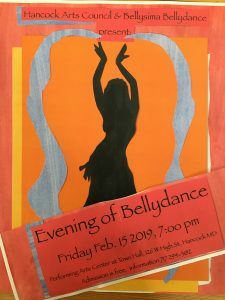 The show, produced by Angela Petry of Bellysima Bellydance in Berkeley Springs, West Virginia, will feature a variety of soloists and troupes from around the four state region. Performers include: the Bellysima Bellas, Miramar, Troupe Asherah, Goddess Sisters Rising, Anam Cara Belly Dance, The Hip Sisters, Deborah Colley and Lindsey McCormick. In addition to presenting the classic dances of the Middle East – Raqs Sharqi, Shaabi and Saidi – the dancers will perform a number of other styles including Balkin skirt dancing, Tribelle Chic tribal, and fusion numbers that combine bellydance with lyrical, flamenco, and tango styles. Swords, canes, veils, fan veils, finger cymbals and candles are among the many props that will be seen on stage. This performance is one in a series of monthly showcases hosted by the Hancock Arts Council. The event is free to the public. Donations for the Hancock Arts Council accepted at the door benefit the ongoing arts council programming and concerts. Petry will also be appearing on the inaugural TV show Prime Time for Women in Hagerstown, Maryland at 10 am on Saturday February 9, 2019. The show will be filmed at the historic Women’s Club of Hagerstown. Tickets to the TV Show can be purchased by calling 240-313-5985.